In this game, players are patients trying to escape a psychiatric hospital together. The adventure has elements of roleplaying. Everyone becomes a twisted character with a set of reality-bending disorders. You see the staff as horrifying abominations and common objects as magical artifacts. You've prepared an escape plan, but even trivial tasks seem like out-of-this-world missions. Hopefully you will find a way to use that to your advantage. Otherwise, the chief hospital administrator will finish his rounds and strap you back to your beds. 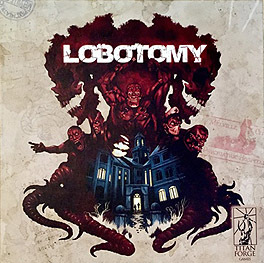 To help you embrace the unsettling atmosphere of the game there are over 50 quality miniatures, dark-themed art and a question: are you really escaping the lobotomy or are you this way because it has already happened?